I’ve been thinking a lot about baseline: What are the things that need to be done every single day to make today a success? I’m a big fan of a habit based lifestyle to take out the guesswork and the ambiguity of choice. Humans aren’t great at making strong, future focused decisions when they’re tired, stressed, overworked or under duress. This means, that most of us stumble around making so-so decisions most of the time. So, the more guesswork we can take out of decision making, the better. It’s one of the reasons that I decided to spend 2017 not making decisions about clothing and outsourced that to a clothing rental company (Le Tote). It’s the main reason I developed the Best Day Ever philosophy around habit-based lifestyles to ensure optimum performance. And, it’s why I finally succumbed to a meal prep box. Essentially, I’m trading money for time and freedom of decisions, so that I can make better ones for the things that really matter. Brian Tracy claims that for every minute you spend in planning, you save ten in execution. Compound that with the concept of “decision fatigue” (deteriorating quality of decisions made the more decisions you make). After all, when we’re making decisions and doing them badly, we set ourselves up to be in the Stephen Covey quadrant of “Urgent but Not Important.” In Covey’s seminal work, ‘Seven Habits of Highly Effective People’, he makes the case that many people spend the bulk of their time putting out daily fires and never work on things that move them toward their true life calling. Daily fires are a waste of time and lead to something that he dubs “urgency addiction.” This is when you become addicted to the adrenaline rush that happens when you solve an emergency. That’s why the meal prep service is so helpful for me—I’m rarely worried about what’s for dinner because someone else figured that out for me and all I need to do is cook it (which I love). Yes, it costs more than shopping in the grocery store myself, but I’ve saved myself the time of the grocery shopping (trading money for time). So I can do the thing that matters most to me after work: Connecting with my family. The key is that our daily tasks and priorities need to be consistent with our lifelong goals, vision and purpose. In his book, Covey has you write down every single task that you need to do and rank them in order of importance. Then, categorize them into the quadrants he outlines in his book. 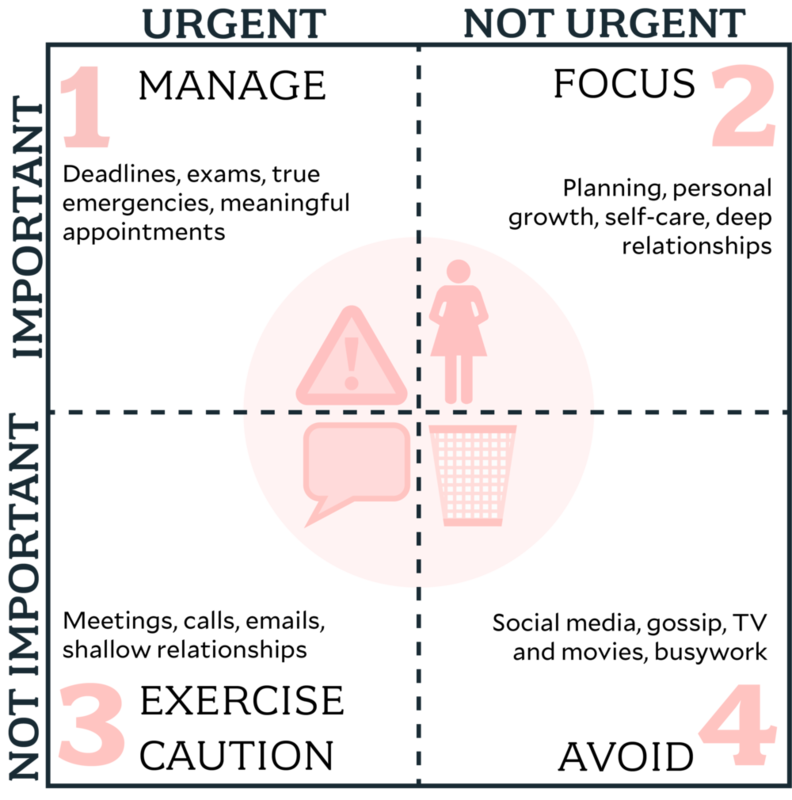 The goal is to be spending most of our time in the quadrant marked Important but Not Urgent. These are the long term strategy movers; things like exercise, planning and learning. Couple that with making a habit-based lifestyle, so that you don’t make decisions on if you’re going to exercise, if you’re going to plan your day or if you’re going to meditate. It’s a solid baseline for designing and living your best life. Here's to living our best day ever, every day.